The Rock960 SBC – developed by Guangzhou based startup called Varms – is built on the hexa-core Rockchip RK3399 and it really stands out from other SBC contenders like the NanoPI M4 despite being a little pricy. 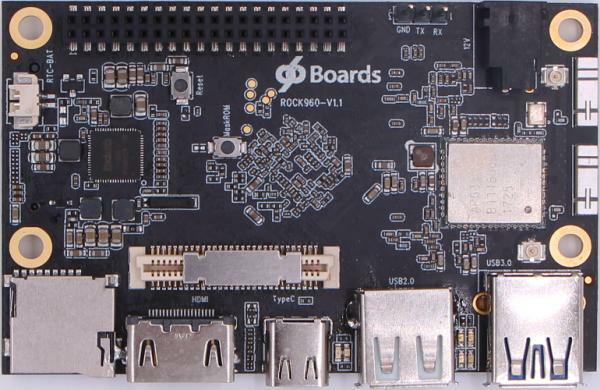 The Rock960 is the only “96boards’s SBC” in the market that is built on the popular Rockchip hexa-core SoC and serves as a powerful alternative to Raspberry Pi. This SoC comes with dual Cortex-A72 and quad Cortex-A53 cores. It also comes with a Mail-T860 MP4 GPU which supports H.264 10bit and VP9 4k video and it is the highest performance GPU built on ARM famous Midgard Architecture. Regarding storage, it comes with 2GB RAM, 16GB eMMC or 4GB RAM, 32GB eMMC. The Rock960 also supports various open source operating systems such as Android 7.1 AOSP, Debian, Ubuntu, Fedora, LibreELEC, Lakka and FlintOS. Schematics and other hardware files are posted on the community website which also says it supports Yocto and Armbian. Despite being one of its kind, it comes with its own challenges. One of the challenges is that the board’s M.2 expansion slot is not in a good position to mount NVMe SSD – says Varms – but the company has provided an optional M.2 Extend board which does not affects the performance of the NVMe SSD. It also has the option to add a metal case -in several colors like opaque, transparent or semi-transparent top- that adds additional heatsink properties in addition to the standard heatsink. Compared to other boards that comes with the Rockchip RK3399 like the Firefly-RK3399 and VS-RK3399, Rock960 is both simpler and smaller and comes in 85mm by 55mm dimensions. The company also offers various “96Boards” expansion connectors like the standard 40-pin low-speed and 60-pin high-speed connectors. There is also a growing list of third-party “96Boards” expansion boards. The Rock960 has a built in HDMI 2.0 port and a DisplayPort (via a USB Type-C port), both with [email protected] video. MIPI-DSI display and MIPI-CSI camera connections are also available along with USB 3.0 and 2.0 host ports and a microSD slot. The Rock960 board also comes in an Enterprise Edition which has similar specs to desktop PCs and it is suitable for those using 3D graphics and Machine learning applications. It is built on a hexa-core processor, packed with a powerful GPU and a dedicated Neural Processing Unit capable of 2.4TOPS (Trillion Operations Per Second) and it has shown it beats both the Apple A11 chip and Kirin 970 SoC in benchmarking.